I was 2 months old and measured 1.1cm in length when I arrived in the Year 2 class at St. Johns in September 2013. I was a little bit scared at first as everyone seemed bigger than me. I soon realised that everyone was really friendly and the children were very kind to me. The Head Teacher, Mrs McKeating keeps calling me a killer snail! I don't think that is quite right. I'm a very peaceful snail and I want to live by the school motto LOVE ONE ANOTHER. I like to play hide and seek with the children and I always like to hide first. I love to dig and hide in my warm, damp soil. I have decided to go on school dinners rather than bring a packed lunch as Mrs Carlile is rather forgetful at times and might forget my lunch tub. The children are very kind at going to fetch my lunch for me as its a bit tricky carrying a tray when you haven't any arms and only have one foot! The VIP collects my lunch from Mrs Shackleton in the kitchen. It is usually lettuce and cucumber. Yum Yum! Every Monday, the children have a look at me and check my shell for holes. If I'm really lucky, I get to sit on a lettuce leaf and eat whilst Mrs Carlile measures me. I am growing approximately 1mm or 0.1cm per week. I will be really big soon. I wonder if I will ever be as big as the children in Year 2? This morning, I couldnt stop laughing! Mrs Carlile, my teacher, came into school very early and I surprised her as I was still playing out and eating my lettuce. She couldn't believe her eyes. She took some photos to show the children. And then...when the children came into class, instead of hiding in the soil, I slid up into the lid and fell asleep up there! The children thought it was really funny. I just wanted to watch my friends working to see if I could help them with their maths and their writing. Im very good at writing as you can see. It's my favourite subject, besides reading. I'm reading The Snail and the Whale at the moment by Julia Donaldson. The snail isn't me, but it is one of my cousins, the sea snail who goes off on lots of adventures. I wonder which books the children are reading at the moment? I noticed someone reading a Horrid Henry book the other day, and Room on the Broom. I like those books as well. Yippee! I've had my first message from one of my friends in Year 2. Thank you Lydia. Lydia asked me how I like living in my new home. My answer is I LOVE IT! This school is a great place to be. Everyone is really friendly and if I have any worries, I tell them to Mrs Carlile and she helps me sort them out. A problem shared is a problem halved! As for my tank, I think it's great. I get to watch the children in Year 2 work all day. I'm very impressed with their work and I know Mrs Carlile is too. I know I have got a bigger tank waiting for me when I have grown a bit more. 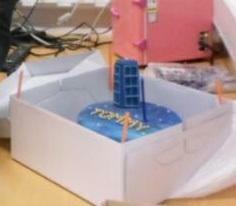 I'm rather excited for this as I know Mrs Carlile has bought me my very own T.A.R.D.I.S. to go in it so I can travel all over time and space...when I finally wake up! I can't wait until next half term when they will be learning more about me. Thank you Lydia for asking. I hope I get some more questions soon. Guess who we saw in the school yard at playtime? One of my cousins came to visit me from the Fenny Fold. What a lucky snail I am. I have had another 2 messages. Both of them from the head teacher, Mrs McKeating! As I've now been a pupil at this school for 6 weeks, she wants a progress report on my writing. Eeeek! I try really hard with my typing but it is tricky to write sometimes, especially holding a pen! I have written Mrs McKeating a letter to show her my best footwriting. Do you think she will be impressed? I hope she lets me stay at this school. She also wanted Mrs Carlile to tell you that I am a dangerous snail as when she was working here late one night, she heard strange noises coming from my corner of the room. The only strange noises I make are muching my lettuce leaves and tapping the keys on my netbook keyboard as I jump around the letters to type. It's exhausting! No wonder I sleep all day! Would you like a sneak preview of my letter to Mrs McKeating? Ssssshhhh, don't tell her as I am going to ask the class V.I.P. to take it to her tomorrow. 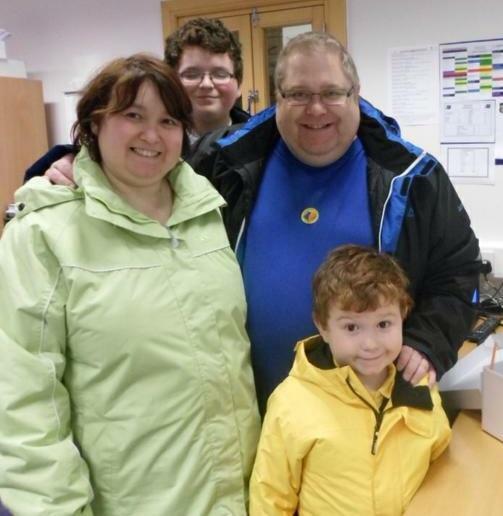 If I am a lucky snail I can have my photo taken with the head teacher and I might even get a sticker? I will let you know how I get on. Wish me luck. Wow! I can't believe how many messages I am getting today. I am a very lucky snail to have so many friends. I have had a message from Ava who asked me if I like Year 2. And then she told me that Year 2 like ME! Phew! I'm glad I fit in. It's hard when you start a new school as you always worry that you might not make any friends. Ava, I'm having a terrific time in Year 2. Thank you for asking and I'm really glad that you like me. I see you a lot as you sit really near me in class. Infact, I'm nearly on your table! Thank you for being my friend. See you tomorrow. And yet another message. I'm going to be up all night at this rate! Thank you Tegan for asking me a question. She asked me how old I am. That's a really good question. I'm not sure exactly but the man in the shop told Mrs Carlile I was about 2 months old. That makes me about 4 months old now. Mrs Carlile has decided to give me a date for my birthday which is 11th July. (Happy Birthday to me...in July!) Thank you again Tegan. Keep those messages coming. Tegan also asked me where I go when school is closed for the holidays. I'm a very lucky snail, I get to go to Mrs Carlile's house where I get to play with her doggy, Bertie. We have a fun time. Thank you Tegan. Ruby has also sent me a message. I am one busy snail tonight! Hopping around on the keyboard on my netbook to answer all these questions. I will certainly sleep tomorrow! Ruby asked me if I'm looking forward to Year 2's assembly on Friday. The answer is YES! I can't wait. I feel honoured that you have included me in your assembly and that you have been learning all about Africa, where I originally came from. Good luck year 2. You will be great! Thank you Ruby for a brilliant question. The class V.I.P. kindly took me to see Mrs. McKeating for my progress meeting. I'm delighted to tell you all that I am doing fine and am allowed to stay on at St. John's school. What a relief! Thank you Mrs McKeating. I love my photo of me in Mrs McKeating's office. I didn't get a sticker though! Wow...loads of questions tonight. Shouldn't you all be in bed? Ha ha ha. Firstly, I will answer Hayden's question. He wanted to know what my favourite food is. To be honest Hayden, I can't decide between lettuce and cucumber. I like them both the same. I'm not so keen on apple or carrot at the moment as it's a bit harder to eat. A bit like when you had your wobbly tooth and found it tricky to eat an apple! Thank you Hayden for your question. Goodness me Tilly. You have been busy sending me 3 messages. Thank you. Firstly, thank you for letting me know that you believe I am not a killer snail and that you are really glad you met me. I'm also glad that I met you. Secondly, you asked me how old I am. Tegan asked me that question last night so if you have a little read back, you will see what I said. I know you are a super reader so you won't have any problem reading my diary. Thanks again Tilly. You must be tired now after sending 3 messages! See you tomorrow. And finally...another question from my friend Ava. I think Ava asked me a super question. She asked me if I prefer living in Padiham than Africa and why is it better! I love questions like this. The main reason I love living in Padiham is that I get to meet all the lovely children at St. John's school. It really is a special place to be and I'm really proud to be a part of it. Also, the school dinners are great. I get waited on a lot here. Everyone brings me my food, Mrs Carlile makes sure my special substrate soil is cleaned each week and I get to watch some very special and friendly children do some amazing work. I miss the warm climate in Africa but I know that I have a heat lamp for my tank when the weather gets really cold. I don't miss the rain as Mrs Carlile mists my tank everyday so it stays damp. To be honest Ava, I see all the children and staff at St. John's as my new family now. I'm well loved and cared for. What more could I want? (Plus I'm becoming a bit of a celebrity!). The school governors came to our school today to have a look around and they walked in our classroom and everyone knew my name! How special did I feel! Well done Ava on asking such a super question. Oh my goodness me...look everyone, read the message below that I received this morning. I can't tell you how excited I am. I will get my friend, the V.I.P. To bring me at break time. I don't think I can wait that long! I wonder what she has prepared for me? A badge made of cucumber? I hope so! I would wear it with pride! Don't be upset about not getting a sticker Stanley. All my stickers are bigger than you! In recognition of your excellent writing and exemplary behaviour I have prepared a special award just for you, I think you will be pleased, I have never given one of these awards out before. I have designed it especially for you! Come and see me at break time. Wow. I can't believe what I got today. Mrs McKeating awarded me a badge that has never been given before. It is a very special rosette with a headteacher's award sticker in the middle! I'm so proud to have received this. Thank you very much Mrs McKeating. I hope I continue to live up to your expectations in Year 2. Guess which room I visited today? The staffroom. How special did I feel? ...and then I got to go into the hall with all my classmates and watch them rehearse for their assembly tomorrow. They look and sound amazing! Can you see me in the middle. I was dancing along with my friends. Jambo, Jambo Stanley...la la la. I have been sent two questions so far. One from Ben and one from Melissa. Melissa asked me what I enjoyed doing in Year 2. The answer is I love reading, writing, typing on my netbook as jumping around the keys is such fun. I also love watching my friends in Year 2. The dancing today was great and once I got the rhythm of the music I was fantastic! Thank you Melissa. Ben asked my why I only have one foot. A great question Ben. But can I ask you a question, why do you only have 2 feet? Ha ha ha. Only joking...I'd quite like to have 2 feet as you all seem to move a lot quicker than me. But you are all kind enough not to leave me behind. I only have one special foot which is actually full of muscles. It is a strong foot! You should watch me playing keepy uppies! The muscles in my foot help me to move. I move quicker when it is warm and wet and if the ground is a little tough and tricky, I make slime to help me slide quicker and safer. I'm reading a book at the moment Ben about snails. It's next to my tank. Have a look at it on page 18. It tells you all about my special, soft foot. A super question Ben. Thank you. Another question from my friend Tegan. She wants to know if I am a killer snail! Tegan, have you been speaking to Mrs McKeating? She thinks the same. I promise that I am not. I'm sure you have noticed that I am a very peaceful snail, like you...except you're not a snail...but you are peaceful! I'm so looking forward to watching you play the drums tomorrow in our assembly. Have a good sleep tonight. See you tomorrow. Oh dear, it seems I was overheard rehearsing for our assembly tomorrow. I thought I was in the building on my own so I was rather loud. I'm very sorry if I disturbed you Mrs McKeating. I'm rather pleased with what she has to say. Here is what she wrote. I popped into school tonight when everyone had gone home. I couldn't believe my ears but I heard Stanley practising for Year Two's assembly. He was playing Jambo extremely loud. I have to admit that Stanley is quite a good musician and he is taking his role in the assembly very seriously. I am impressed with his conscientious attitude and am looking forward to the assembly. Stanley is beginning to impress me, I hope he will be on his best behaviour tomorrow and that all our guests coming to see the assembly will be safe. A message to me, all the way from London! Did you know that London is the capital city of England? I read that in a book. The message is from Miss. Carlile, I think that is Mrs. Carlile's daughter. I know she moved to London a few weeks ago to go to university. She is coming back to Lancashire for half term so I will get to see her again. She was very kind to me when I stopped with them in the summer holidays. She is training to be a teacher and I wonder if her school in London has a celebrity snail, just like me? This is what she said. Wow, an invitation to London! Maybe I would get to have cucumber sandwiches with the Queen at Buckingham Palace! Thank you Miss Carlile. I will see you at half term and we will discuss my visit and travel arrangements. Wow...I'm still recovering from the most amazing assembly I have ever seen by 6 year olds! Year 2, you were the best! I was so proud to be to be part of it. Thank you for allowing me to be a massive part of it and for putting me right in the middle of the stage so that everyone could see me dance in my tank. You certainly had my foot tapping to the music! I'm glad your parents got to see me on the stage. I did wave at them all but I'm not sure they would have seen me at the back! Have a good rest this weekend Year 2. You deserve it! I will see you in Hogwarts on Monday morning. I've got my cape ready and my ticket for platform 9 3/4. Bye bye. Kayleigh has sent me a question and has asked me where Africa is. A great question Kayleigh. 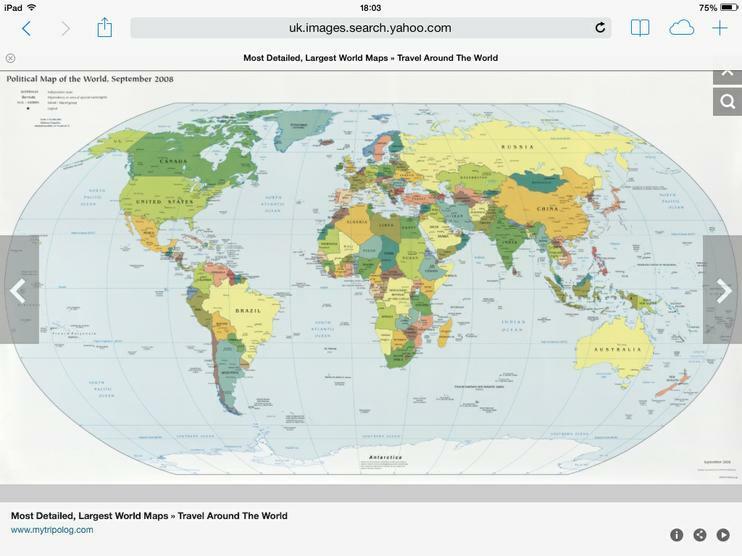 You can have a look at my globe on Monday but for now I can show you a picture of a world map. Ask your Mummy and Daddy if they will show you where England is compared to Africa, you will notice that our country is tiny compared some of the countries in Africa. A super question Kayleigh. I was so busy rehearsing for year 2's assembly yesterday that I forgot to share with you the song Mrs McKeating wrote, especially for me! The whole class sang it to me in the morning and the african drummers played their drums. Mrs McKeating came to join us. I'm not sure I like what she is suggesting in the lyrics but I do like the fact that she goes home and still thinks about me, Stanley, the Celebrity Snail. Here are the lyrics she wrote. The class sang them to the tune of JAMBO...JAMBO BWANA. Hello Melissa, thank you for asking me a question on a Saturday night. I was wondering what I could type about and now I can answer your question, even though I can answer your question in one word! You asked me what I do at play times! The answer is...SLEEP! I tend to do most of my sleeping in the day so sometimes I don't even realise that I've missed playtime! I get to play at night. I like to stick myself in the lid of my tank and swing upside down, I also practise keepy uppies? I also like to write and I love to read in my spare time. I've started a new book today, I'm reading Harry Potter ready for Monday. I love it but it is a tricky read with lots of words on the pages. What book are you reading at the moment? I will see you at Hogwarts on Monday. Hello Oliver, thank you for sending me 2 questions. Firstly you ask why I like living in Padiham. The answer is I love being a part of our school. St. John's is a very special place to be and is full of wonderful children who love me and help care for me. I have everything I want right here in Padiham so I have no need to go anywhere else...except in the school holidays! Secondly, you asked me what I have been up to this weekend. To be honest, I have been reading a lot trying to see what adventures Harry and his friends got up to in Harry Potter and the Philosophers Stone. I particularly liked chapter 14 which was all about Norbert the Norwegian Ridgeback Dragon. It reminded me of Year 2 last week when they were writing poems all about dragons. I am so looking forward to tomorrow to see which house we all get sorted into. I hope I get Hufflepuff as I huff and puff when I jump from each key on my netbook. I wouldn't mind Slytherin either as I slither and slide along the ground. I'm really looking forward to all the lessons you are doing next week such as Herbology, potions and cooking in the kitchen of the Leaky Cauldron. You will also be going to Olivanders shop to make a wand and then having a wand duel in maths! I bet you will like that Oliver, you are good at maths. Plus I know Mrs Carlile has lots of exciting things planned for you all to do and make. See you at Hogwarts tomorrow. All aboard the Hogwarts Express...I've got my ticket. Well, what a busy day! I've made pumpkin soup and a wand! My wand is made out of beech and its magical core is a phoenix feather. I had great fun trying to roll the paper with my one soft foot! I was sorted into my Hogwarts house this morning and it must have read my mind as I wanted to be in Hufflepuff...and I am! How good is that. I've tried really hard to earn housepoints for Hufflepuff today. I hope I don't let them down! I can't wait to see what I'm doing tomorrow at Hogwarts...I just hope that it isn't potions where you need a snail as part of the ingredients! I'm not volunteering for that! Do you like my cape and hat! I think I look just the part! Day two of Hogwarts...and I still haven't been put into a cauldron! What a relief! I've had a funny day today. I've had a great day watching year 2 work hard in their Hogwart's lessons with Mrs Carlile this morning and Mrs Barker this afternoon. But then you will never guess what happened! Mrs Carlile opened my tank to throw away my old food into the bin, picked up a piece of lettuce, swung it towards the bin....and I was asleep in the middle of the lettuce leaf. I managed to hang on but it was a bit scary! Flying snails! Mrs Carlile gave me a cuddle and a new piece of lettuce and put me safely back in my tank! What an adventure! The good news is that whilst I was out of my tank, Mrs Carlile measured me and I have grown 3mm. I'm now 2 cm long! How cool is that? It made me feel a bit better though after clinging onto a lettuce leaf for dear life! I nearly had to use my magic wand! I'm keeping my magic wand near me today incase I go flying again! What a relief to find that owls do not eat snails! I was a litle bit nervous about the birds of prey being in the hall! However, once I found out that I was safe, I became brave and went to meet the birds. They were really friendly. The big owl had had a bath and was still a bit soggy! Have a look at my photos to see how brave I was. Look at how slowly I move compared to the other students at Hogwarts! Oliver asked me what I like to do at night...the answer is I like to type. I love jumping around the keyboard. That is why I like to be asked lots of questions. I also like to eat as I usually sleep all day so I catch up with my eating at night. Thanks Oliver. Tilly and Evie asked me similar questions. They asked how I felt when I saw the owls and how I felt having my photos taken with them. Great questions. I was very nervous at first as you know, which is why I wouldn't come into the hall at first as I thought the owls ate snails! Luckily, they prefer mice, rats and shrews so I knew I was safe. Mrs Howley (Mrs Owley as she became known today) took me in the hall to see how I felt when it was a bit quieter. Once I saw the birds, even though some of them were huge, I knew they wouldn't eat me. So I became very brave and had my pictures taken. Once I started, I couldn't stop! They were really beautiful birds, not scary at all...I'm a brave snail aren't I? Tegan asked me how I felt when Mrs Carlile nearly threw me in the bin! Super question Tegan. To be honest I was a bit worried for a moment as I thought I had done something wrong or wasn't wanted anymore! Thankfully, I couldn't have been more wrong. I should have known I was loved at St. John's school and I won't be hiding in my food again for a while! (Actually, it was quite exciting flying through the air but don't tell Mrs Carlile that as she will be throwing me all over the place! ). Jayden asked me why my shell is so shiny. Great question Jayden. I have been waiting for ages for someone to ask me this. The answer is I use snail polish....do you get it? I'm so funny sometimes I could laugh my shell off! Actually, it's mainly because I'm so well looked after. I have a very healthy diet with plenty of calcium to make my shell strong and healthy. I also get my tank misted so my shell sometimes looks damp with the water. A great question Jayden. A house point to you tomorrow! The final question for the evening...Alfie asked me why I am so funny. Alfie, that is a question I ask myself everyday! I think it's just one of my many talents. Did you get my joke that I just wrote when I was answering Jayden's question? SNAIL POLISH! Ha ha ha! I do have a great sense of humour Alfie but I also read a lot of joke books! I'm a snail that just loves to read and write. That is why I learn a lot and have improved so much in my writing. Practice makes perfect. See you tomorrow Alfie. Thank you Year 2 for giving me a reason to write tonight. I do love answering all your questions. Have a good nights sleep ready for the final day at Hogwarts tomorrow. Mrs McKeating has sent me a very long message! I thought I was in trouble for a moment but thankfully I'm not. However, she did catch me practising my magic last night...I was trying to turn my tank into a castle! Oh well, I will keep on trying. Please can the children read Mrs McKeating's message and help me answer the puzzle of how many school dinner days there are in November. I could really do with a free month of school dinners. Thank you my friends in Year 2. I have not been in school for two days and I have to say I have missed you! You will be glad to know that every day I check the school website and read your diary. I can't believe what happened to you when Mrs Carlile was cleaning your house, you poor thing. For a little snail you do get yourself into big trouble! After my course last night I did come back into school for a very important meeting with our school Governors. I have some exciting news for you, hold on to your shell I think you will be pleased. The Governors have been reviewing our new website and are particularly impressed with how many year two pupils are writing to you at home. We love to reward enthusiasm at St Johns and have decided on a special reward that I am sure you will enjoy. For the whole month of November you will not be charged for your school dinners, they will be free! Get the children to work out how many free meals you will get and how much money it will save you! I hope you are pleased, we love to reward and encourage writing at St. John's. If you carry on like this who knows what the future may hold for you? Oh, by the way as I was locking up after the Governor meeting last night I am convinced that I saw some sparks through the glass panel to year Two's classroom. I would have gone in to investigate but I didn't have the key on me. Were you practising magic with your new wand? I hope you haven't made a mess in class 2 because Mrs Carlile likes a tidy classroom and she stayed behind very late last night getting things ready for the children's final day at Hogwarts. make sure you get tidying! I just can't sleep! I hope I don't fall asleep in my office tomorrow! Look at my castle! Now that's MAGIC! My magic wand works. I now have a castle to live in! The problem is I don't think my magic will last and it may turn back into a small tank. But never mind, it worked for a day! It was great fun to be a part of the potions lesson. Thankfully, Mrs Carlile did not need a snail for the ingredients for the potions! We all used our magic wands and Mrs Carlile helped me use mine. We all wore our safety googles incase the school blew up! Mrs Carlile made sure mine fitted me perfectly! And finally, the Awards Ceremony in the Great Hall at Hogwarts. Wow, what an amazing experience. The whole school were sat in their houses, Gryffindor, Slytherin, Ravenclaw and Hufflepuff, (my house). I sat near Lydia and James as I knew they would look after me and if everyone stood up and cheered, Lydia would grab me and rescue me! The pumpkins looked amazing and they covered the front of the hall. Abe won from our class...his pumpkin looked like Harry Potter! I though they all looked great, I'm glad I wasn't judging. Well done to all my friends in Year 2. I couldn't believe it when they announced the winning team from the four houses! HUFFLEPUFF! I was so proud and I did nearly get squashed with all the jumping and cheering. Thankfully, Lydia knows how to protect me! I shall now be known as Stanley Hufflepuff as I'd like that as a last name. I think it suits me. 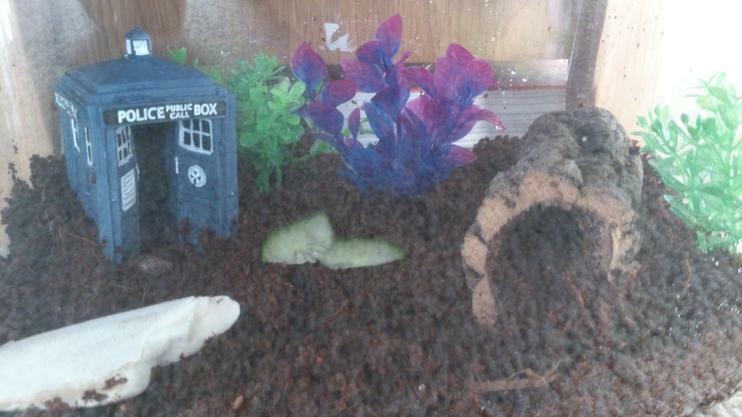 Sad news, my magical castle has disappeared and I'm back to my small tank. Mrs Carlile has promised me something magical to replace it though. I hope it is something made from cucumber. I'm just packing my things now to go to Mrs Carlile's house for the holidays. I seem to have a lot of things! 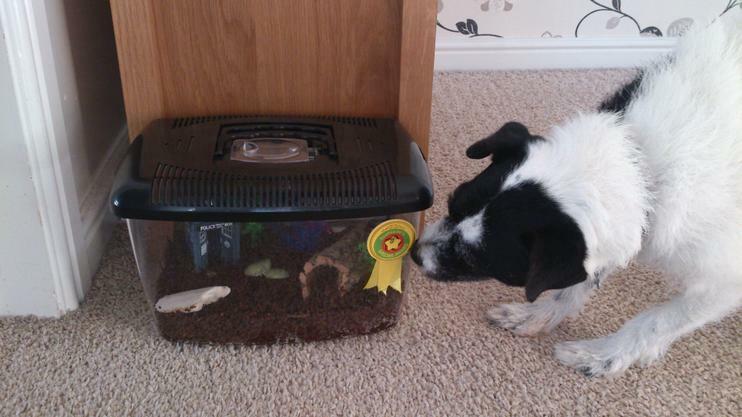 I can't wait to see Bertie ,the crazy jack russell again. I wonder if he remembers me! Please keep in touch with me Year 2. Mrs Carlile has promised that I can use her Ipad to type as it is quicker sliding from key to key than jumping on a keyboard. Have a good week off, stay safe and please send me messages if you can. I need something to type about. Well, I made it to Mrs Carlile's house. Bertie the jack russell was very pleased to see me. I think he wanted to share my lettuce! Mr Carlile was also very nice to me. He was very impressed with how I have grown. He was telling me all the things he likes such as mushrooms, snails and garlic butter. That's nice! I think I will enjoy my week here. There is lettuce and cucumber in the fridge and I have spent all my time here stuck up in the lid so I can see what is going on. I have only just had chance to check my e-mails as Mrs Carlile forgot to leave me a netbook or her Ipad last night! You will never guess...I have had a message from a girl in Year 5! Wow! Can you believe it? Year 5 is so far down the school corridor. It would take me 3 days to get there! And they have heard about me. How fantastic is that! Thank you very much Megan for contacting me. It wasn't a question that she has sent, but a compliment! She thought my dancing in the Year 2 assembly was fantastic! Can you believe it! She saw me doing all my moves in my tank at the back of the hall. I'm so glad that someone saw me besides the children in Year 2. Thank you very much Megan. It is great to hear from you. I am such a lucky snail. Mrs Carlile showed me a card that my friend in Year 2 made me. Thank you Melissa. It is amazing. I love the picture of me. It must have taken you ages! (And the card had a little present inside...just for me. To help me with my writing!). Thank you Melissa. You are very kind. Mrs Carlile promised me a treat and look what I have got! A brand new big tank, lots of plants, some bark and my very own T.A.R.D.I.S. It is like an adventure playground in here! I love it. Bertie has checked it out to make sure I can't get out...and he can't get in! I'm such a lucky snail. I can time travel now and go and see lots of fantastic places. Where should I go first? Forward or back in time? Please send me a message and help me decide. I promise to be back for the beginning of term. Good morning everyone. 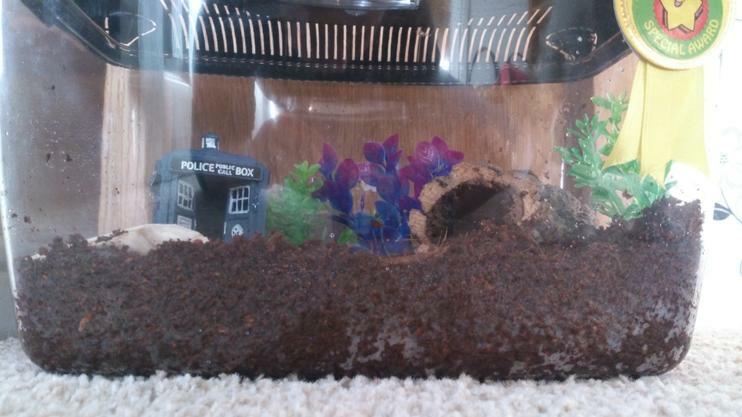 Tilly has sent me a message and she is hoping that I am having a good time in my new tank. The answer is 'YES' Tilly, I am. Infact it is so big I'm worried I might get lost! 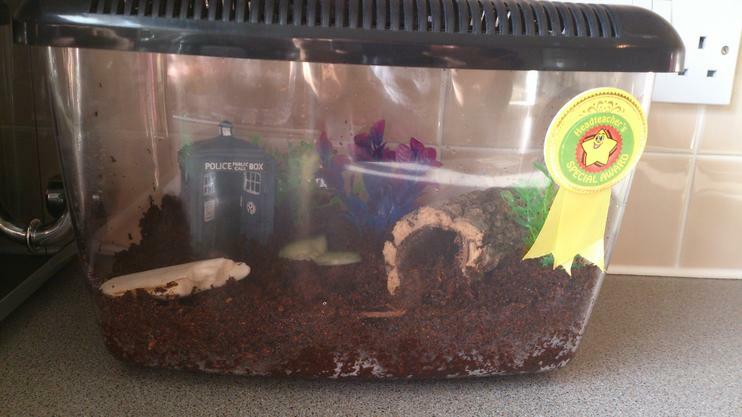 I love my TARDIS and when I always dig a hole in front of the TARDIS to go to sleep in. I love it! I'm still awake at the moment though as Mrs Carlile's boiler has broken and the nice gas man has come to repair it. I wonder if he would like his photo taken with me? Most people do once they realise I'm a celebrity! Mrs Carlile is just trying to keep Bertie away from the nice gas man. Bertie gets very over friendly with people. He just loves people but they don't always love him back! I hope the nice gas man manages to fix the boiler so that we can all be warm again! Thanks for sending me a message Tilly. I hope you are enjoying your break. See you on Monday. I was chatting to Bertie during the night and he tells me he has a job! A very important job! 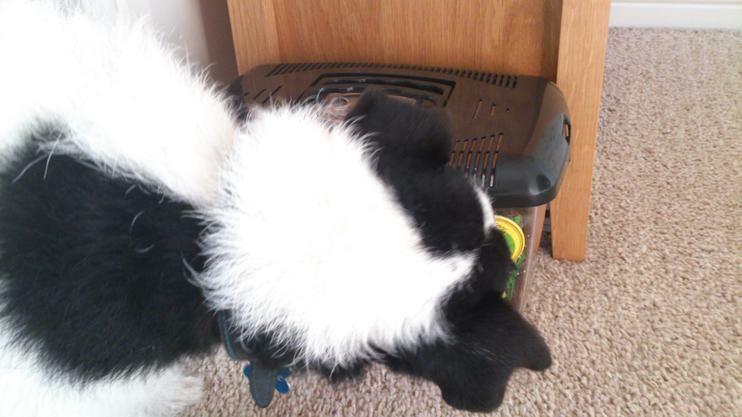 He is an International Tough Toy Tester for an online pet store! He gets to test all the toys and see how tough they are. He is a dog that loves to chew and destroy so not many toys pass the Bertie test! Here is the link to read all about Bertie's job. I'm very proud of him. 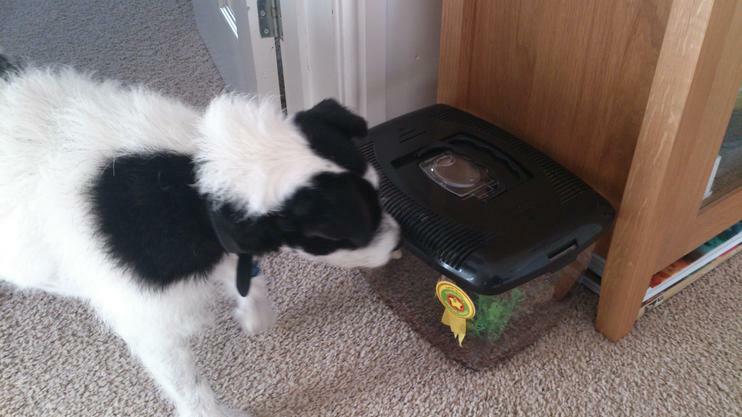 I have been in contact with bow-wow-pets owner to see if there is a vacancy for a snail. I have had a reply and we think that if I practise time travelling enough, I could get on the website as the official intergalactic time traveller to test snail toys of the future! Wow! Mrs Carlile went into school today and brought me a book back to read. It's called FANGS - Operation Golden Bum....he he he. That's really funny. It's by an author called Tommy Donbavand who has also written the Scream Street series. The FANGS series is his new series. There are 4 books out now and 2 more out early next year. 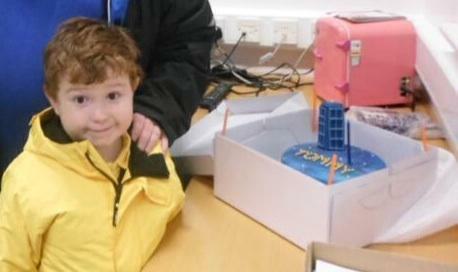 Tommy has been to visit our school a few times and has inspired lots of children to read and write more. I wonder if he could help me with some of my stories! When I have finished the book, if anyone wants to borrow it, you are more than welcome! 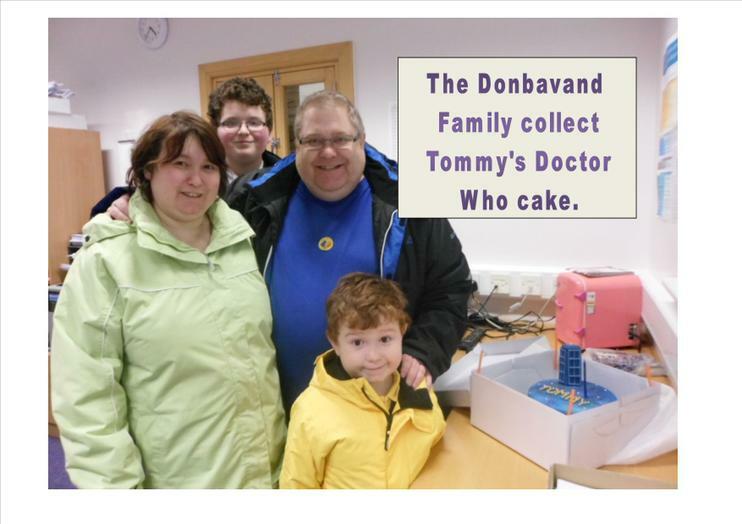 There are lots of Tommy Donbavand's books in school for you to borrow and read. I know Mrs. Carlile will be reading you one called 'they came from Class 6C' next week. It's about class pets! I wonder if there is a snail in it! Don't forget to ask me lots of questions...and please let me know about my school dinners as soon as you have worked it out. Thank you. Hello everyone. Thank you Ruby for asking me a question. Ruby wants to know if I am going to see a bonfire this year. To be honest Ruby, I probably won't. I know they look fantastic, as do the fireworks, but I am a little snail and the loud noises make me really scared and make me want to dig even deeper in my soil. I might just set off in my TARDIS somewhere that night, somewhere a bit quiet where there are no fireworks. Are you going to one Ruby? Thank you for asking me a question. Well what an exciting time I'm having at Mrs Carlile's house. Yesterday was Mrs Carlile's birthday so I got to go in the car with her family and Bertie to see another Miss. Carlile in Manchester with Mr. Carlile, Miss Carlile (from London) and you won't believe this...another MRS. CARLILE! How fantastic was that! We had a take-away for her birthday and birthday cake...well I had lettuce and cucumber. Yummy. We got really back late last night. Bertie was a bit noisy in the car, not like me! I was on my best behaviour all day. Mrs Carlile said she could take me anywhere! How good is that. 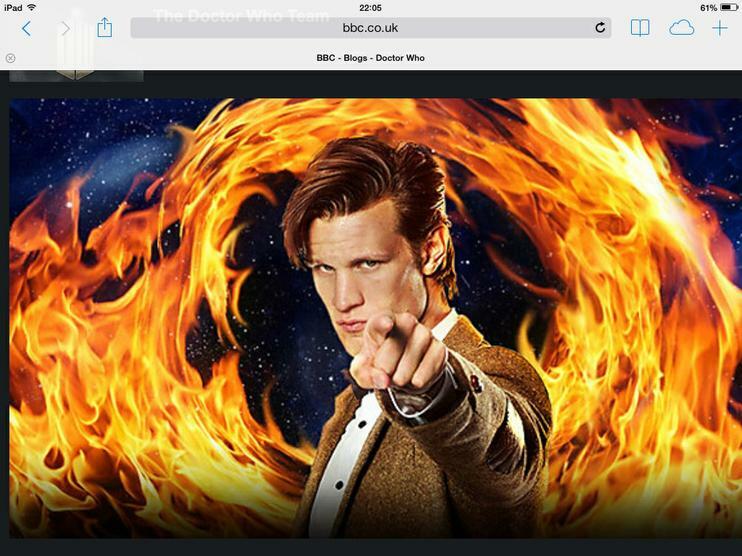 Have you seen the new icon for Year 2 on this website? IT'S A SNAIL! 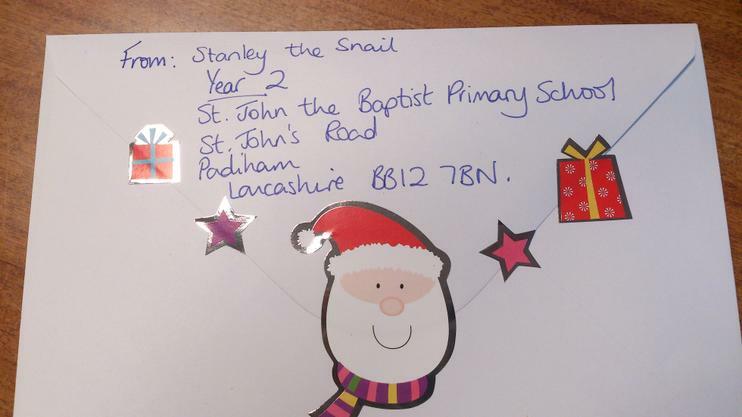 Goodbye tweety bird, hello Stanley Snail! How lucky am I. Now everyone will know how to find me...just follow the snail! Hello again Tegan. Thank you for asking me a great question. Tegan asked me what would happen if I didn't get any light? Wow! A fantastic question Tegan. The answer is that I do not like the brightness of the sunlight, which is why I hide in my shell and sleep all day when it is bright and sunny. If it was too bright for me all the time, I would stop eating and then I wouldn't grow up to be a big, strong snail. That is why I am usually nocturnal and only come out at night to eat and play. So although I do like some light, but not bright lights, I prefer darkness or very dull cloudy days. I bet you prefer bright sunny days don't you Tegan? Thank you for asking me a question. I hope you are enjoying your holidays. I will see you on Monday. It was great to see all my friends again in year 2 today. 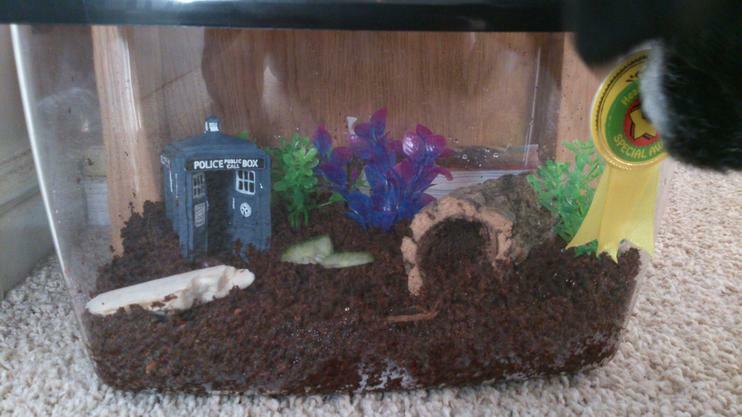 I noticed a lot of them admiring my new tank and TARDIS. It's a pity that my friends can't fit in it with me though. I hope I get lots of messages from my friends again. I love writing. I'm really looking forward to the Big Write this Friday! I can't wait. In class we are reading 'they came from class 6c' by Tommy Donbavand. It's a very exciting book about class pets that become aliens! I'm going to star in it this Friday. You will never guess! I've had a message from Evie in Year 3. That's about a days travel down the corridor! Wow. I can't believe that people have heard about me. I must be more famous than I thought! Evie wanted to know if I am having fun in Year 2. The answer is YES. I have lots of fun in year 2. We are always very busy but we have fun as well. I love being a part of St. John's school. I hope you do too Evie. Thank you Evie for asking me a super question. Please come and see me anytime you want. I have been sent 2 questions so far tonight. Charlie and her big sister Alicia have asked me a question. Charlie asked me where I would live if I lived in Africa. I would definitely live in Kenya. I think Kenya is a beautiful place to live and I would have lots of giant snail friends there. (Mrs Carlile also told me that the best 'tea' is grown in Kenya and she only likes Kenyan tea bags.) However, do not panic Charlie as I am not going to move there. I love it here in Padiham with all my friends. Hello Alicia, you asked if you can come and see me...of course you can. Please do as I would love to meet you. I will hopefully see you soon. Alfred asked me if I like playing with dogs and all my friends. I love playing with Bertie, Mrs Carlile's doggy...but he can be a bit bouncy and giddy! I would love to meet other dogs but I'm not sure how often I will get the chance. Luckily, I have lots of friends at school and I do love to watch them learn. I love the story they are reading at the moment, 'They came from Class 6C' by Tommy Donbavand. It makes me giggle to hear about the class pets that become huge and eat the teacher! I would never do that to Mrs Carlile...or would I? Ha ha ha. Only joking everyone. Who knows, I might be an intergalactic alien snail from another planet and galaxy! Watch this space! I am such a lucky snail to have such thoughtful and caring friends. Ruby has brought me a poppy in to school today to wear. It is a bit big for my shell so we have taped it to my tank. I am so glad that I can remember the reason why we wear poppies and share this with everyone. Thank you so much Ruby. (And I am so glad you are back in school as I know you had a bit of a problem with your nose yesterday...) I am wearing my poppy with pride. LEST WE FORGET. Yippee, I've had 2 questions, both from Oliver. Sorry I didn't reply sooner but your message got buried in all my other emails. Oliver asked me if I was scared of the fireworks. To be honest no I wasn't. I'm going to let you into a little secret...a super snail fact...I don't have any ears! I can't hear much at all! However, I do feel the vibrations that noise makes. That's what helps me with my music, singing and dancing. Oliver then asked me which colour is my favourite. The answer is GREEN! I love green. If it's green, then it must taste yummy. I love having my 5 a day. I'm a healthy snail. Thanks Oliver. Guess who came to see me today? Sandy the garden snail. Poppy found him in her garden and has been caring for him for a few weeks. He came to school to see me! I'm such a lucky snail. He was a very brave snail...he wasn't shy at all, not even when Mrs. McKeating came to see him. I hope I can be that brave one day. Thank you Poppy for bringing him to see me. Let me know how he is getting on. CHILDREN IN NEED - Dressed up in my Pyjamas with my Teddy (Mr. Snail) and my friends in Year 2. Mrs McKeating...guess what? The children did their homework and worked out how much money I could save in November on my school dinners. The correct answer is that there are 20 full days in school in the month of November. 20 x £2.10 = £42.00. So if you agree, I can save £42 this month on my lettuce and cucumber bill! Most children got the correct answer but even the children who were eager to add a few extra days in school during November still did all their working out correctly! How brilliant are my friends? I hope you are happy with this answer Mrs McKeating. I'm sure you will be in touch with me very soon to let me know your answer. P.S. Thank you for letting me wear my pyjamas today. My slipper has kept my foot toasty warm all day! Yippee, a question from Tegan. Tegan asked me what I like to drink. That's a great question Tegan. I don't like orange juice or blackcurrant but I love water. Mrs Carlile has to be really careful not to put water in my tank whilst I am so little or else I might drown. I get all my water from my food such as lettuce and cucumber. They have a very high water content. When I am a bigger snail, I might be able to have a very shallow bowl of water though! Thank you Tegan. Another message from Mrs. McKeating. Now I am really excited! She has bought me a 'Festive' surprise! I wonder what it is...and I get £42 knocked off my lunch bill. Phew! Thank you to all the children in Year 2 for being smart with their homework. And yes, I have got dressed out of my pyjamas...eventually! Read her message below. Phew, what a relief, your friends have come up with answer to my dinner money question. Well done everyone, I see your maths skills are coming on nicely. I will let Mrs Boyd know how much to knock off your bill. I am so impressed with you at the moment that I have decided to buy you a special present to brighten up your tank for Christmas. Come and see me on Tuesday as I am not in on Monday and I will give you your special Christmas decoration. It should make you feel very festive and it will keep you company in the evenings when the children have gone home. I might just have another challenge up my sleeve for you watch this space! Lots of love Mrs McKeating. P.s. I hope you have got dressed now! I couldn't find a single person in school on Friday who wasn't wearing their pyjamas. I hope everything will go back to normal on Monday. Now I am far to excited to sleep. I have had another message from Mrs McKeating. Guess what? Besides buying me a Christmas decoration to decorate my tank, she has bought me another present as well! Oh my! Two presents! I think I must be the luckiest snail in St. John's School. Thank you Mrs McKeating. I can't wait to see what you have bought me! You are very kind to me. Oh my, oh my, oh my...Mrs McKeating brought my presents in today. I am a very lucky snail. 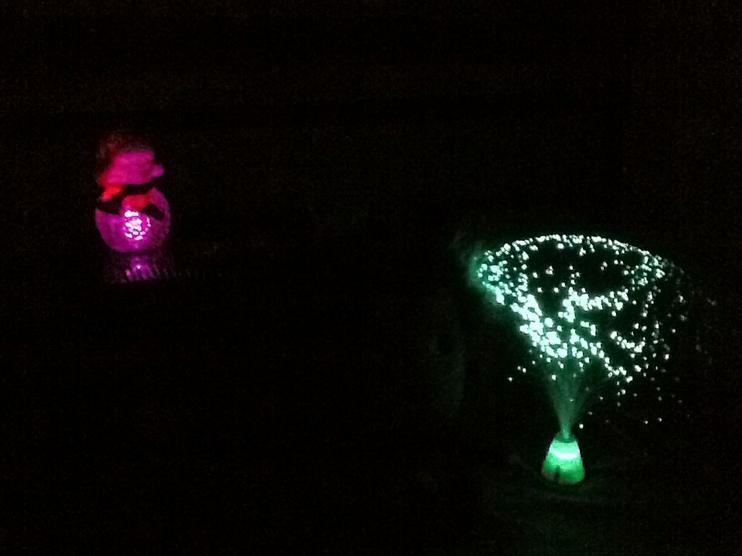 My Christmas decoration is a light up Snowman and he is wearing a green hat and scarf...my favourite colour! She has given me permission to keep it out now as usually, as a snail, I am always the last to finish anything...so I can be the first to put out my decoration. Yippee. She has also bought me my very own TURBO snail training partner. I can practise racing up and down the class room either at the side of TURBO or a could catch a lift on his back and go really fast! Wheeeeeeeeeeeeee! Thank you so much Mrs. McKeating. I promise I will start my training regime tomorrow. I'm so lucky! Guess where I was hiding when she came in...I was hiding inside my hollow log hanging upside down! I'm such a funny snail! Just when I thought that today couldn't get any better...It did!!!!!! Look at what was waiting in the classroom for me this morning...my very own 'Snail Mail' box. 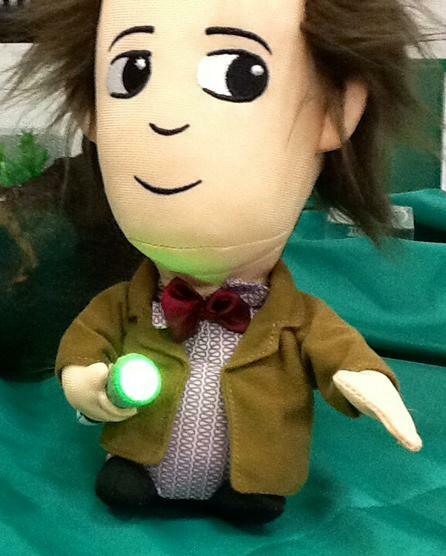 It looks just like me...a very handsome chap! It is huge! ( I thought I saw Miss. Hartley sneaking in to Year 2 this morning with a large parcel in her arms! )The children are so excited that they now have somewhere to post my mail and I can also write to them and post it in my Snail Mail box. A massive thank you to Mrs Connie Moore who made this for me. Mrs Carlile rang her up to thank her on my behalf and the children are drawing her some pictures and writing some letters to say thank you. I just can't believe how loved I am at St. Johns...I couldn't imagine being anywhere else! I'm having so much fun with TURBO snail! I trained on his back first and then we had a race. Look at the photos and check out the photo finish...I won! Well what a busy night I've had! I've been training really hard on TURBO snail and I am nearly an expert! Thank you again Mrs McKeating and to Matthew McKeating for choosing the present for me. Matthew has actually sent me a message and has told me he loves watching my video on TURBO on my diary pages. It makes him laugh. Matthew, it makes me giggle too! He also wanted to know my last name. My full name is actually Stanley Wilbur Hufflepuff. I love my name and I am very proud of it. Matthew also wanted to know if I have written to Santa yet. The answer is not yet Matthew. I have an envelope and a piece of paper ready but I'm too busy playing on TURBO to write these days. I think I need to have a night off this weekend and do some writing. 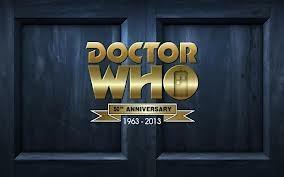 Although I will be watching the Doctor Who 50th Anniversary special episode tomorrow! I'm very excited for that...is anyone else? Thanks again Matthew. See you soon. Wow, what an exciting day. I'm so proud of my friends in Year 2. 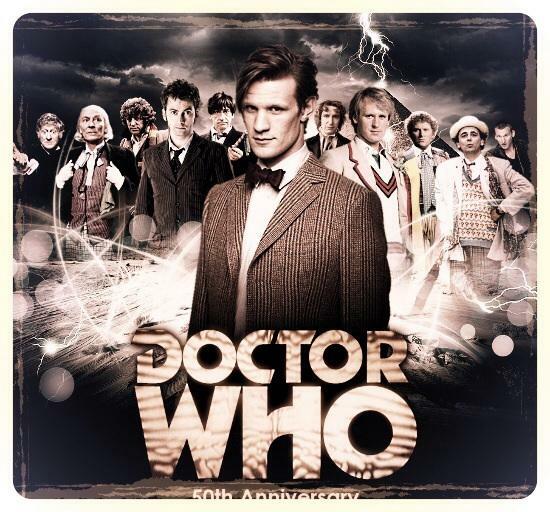 They have managed to raise £463.04 for charity today by holding a Doctor Who Coffee Morning to help celebrate the 50th Anniversary of the TV show. Mrs Carlile is very proud of her class. Guess who came to see me after the coffee morning? You'll never guess...only the fabulous author of my favourite book, 'They came from Class 6C', Tommy Donbavand and his lovely wife Kirsty. They came into class to see little me! I have had my photo taken with him as proof. He also loved our reading corner as we had lots of his books in our class library. Thank you Tommy for taking the time to come and see me. We hope to see you again in school really soon. HAPPY BIRTHDAY DOCTOR WHO. Today is a very special day in history. 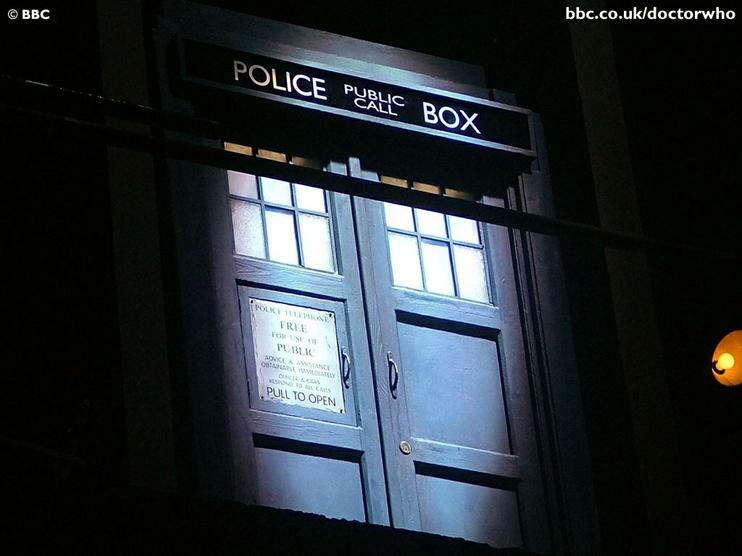 50 years ago, on this day in 1963, a brand new Sci-Fi programme was introduced to television...DOCTOR WHO was born. I was only born this year so I haven't seen any of the episodes yet so I am very excited and honoured that the first episode I will be watching is a very special episode. Let me know what you all think of it if you get chance to watch it. Enjoy your weekend. These are some of my favourite photos of Doctor Who. The one with Mrs Carlile on is when she went to Cardiff with the Campbell family. They invited her when they won the BBC Children in Need Competition in November 2008. She is actually in the real T.A.R.D.I.S. 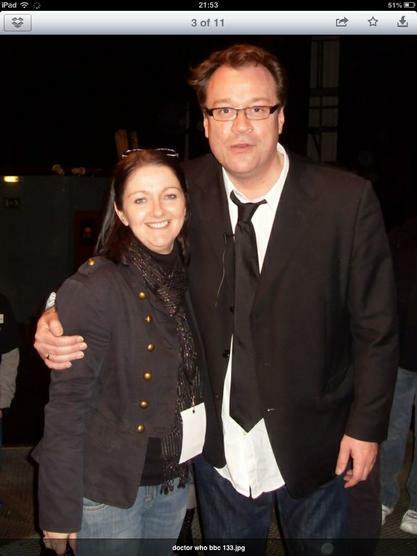 with the brilliant man who brought Doctor Who back to our screens, writer and producer, Russell T Davies. She was telling him all about our school and how his writing has influenced boys' reading and writing. He was very pleased to hear it. 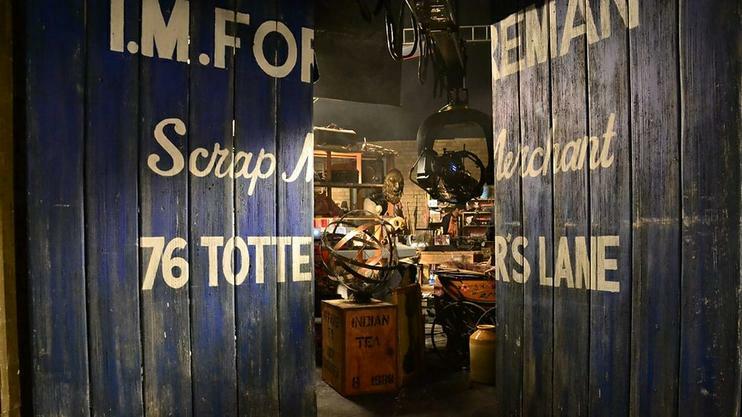 She also got to go on all the film sets and got to meet all the Daleks, Ood, Cybermen, Scarecrows and other strange aliens. She wasn't scared one bit! She loves this photograph...it is her favourite, except for the ones taken with me of course! 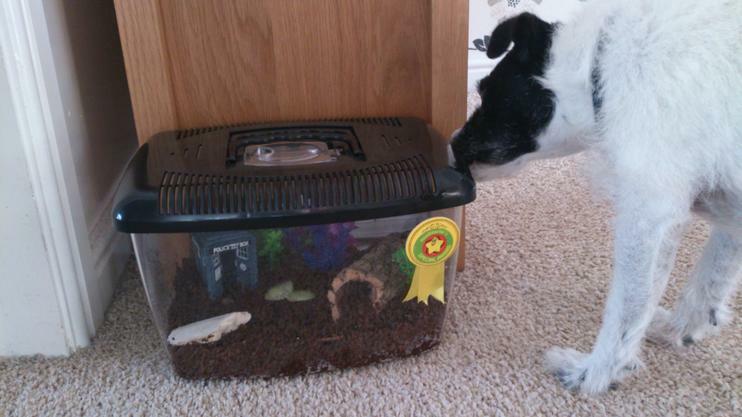 I hope you have all read by now on Class 2's page that I have been a very brave snail and I am going to share the joy with my furry friend and cousin, Mr.Snail. He will be coming to all your house where he can have lots of cuddles, be read a bed time story and then he can share his talents of writing poetry with you all. 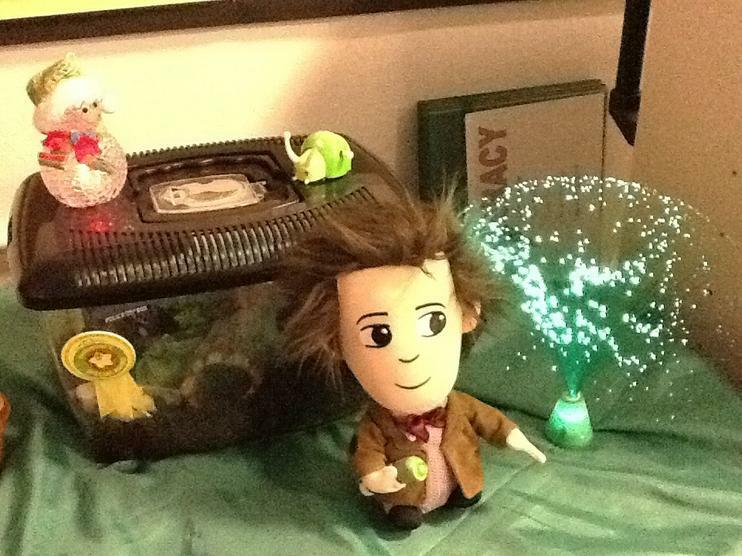 Mrs Carlile was a little bit worried that I might be lonely left on my own at nights since Mr. Snail will be going home with the children...so guess what she has given me...her teddy...THE DOCTOR! He's fabulous. 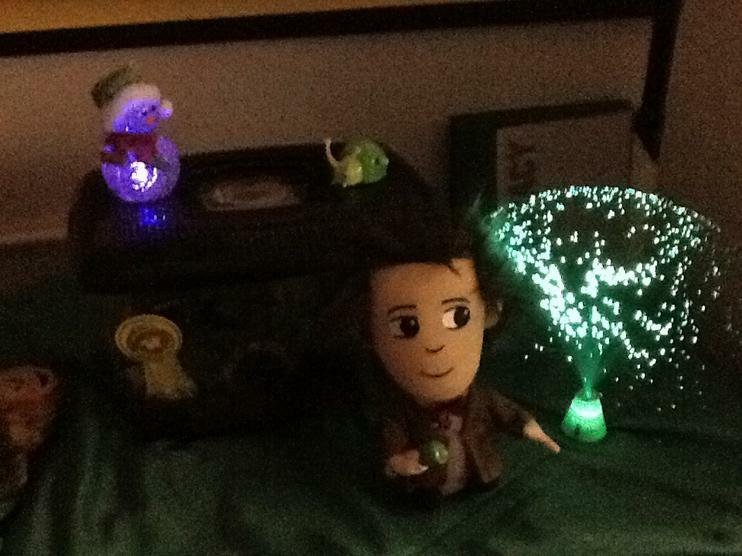 He talks and his sonic screwdriver lights up! How good is that! 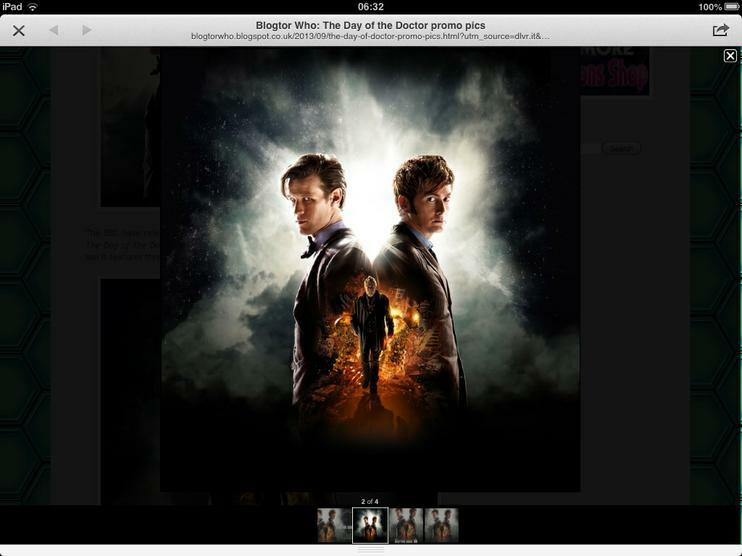 Take a look at the picture of me and The Doctor. Thank you Miss. Carlile for your letter all the way from London. I love the stamp on the envelope...it's a T.A.R.D.I.S. Mrs Carlile read the letter to the class and then all the class had a look at it and looked at my name and address on the envelope. My first letter through the post. It is now on my SNAIL MAIL notice board. Thank you again Miss. Carlile and I will see you at Christmas when I come to stay at your house. Have a think where we can go and what we can get up to whilst you are home. I can't wait to see Bertie again. Does Bertie have his own Christmas Stocking? Ahem...will I have my own Christmas Stocking at your house? I hope Santa knows where to find me. I will write to him and tell him. I'm a very good snail who just loves to write! Thanks for coming to see me Sam, Aaron and Tommy. I hope to see you all again really soon. Have a lovely weekend. P.S. Thank you Sam for naming my Snowman Christmas decoration...he is called FROSTY. I love it. What a cooooooooool name! 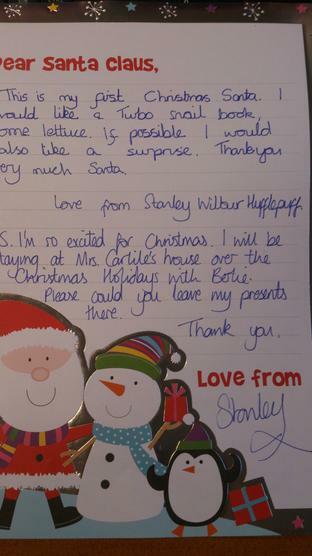 My letter to Santa - Yippee! 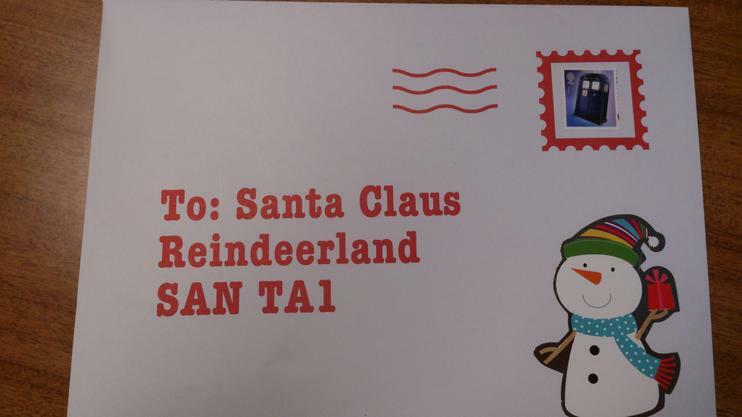 Yippee, today I received my first Christmas Card...ever! Thank you Lydia. This will be my first Christmas so I am very excited. Mrs Carlile has also told me that she has been shopping and has bought me my very own Christmas Stocking. That must mean that Santa will find me at her house at Christmas. She is going to hang it next to Bertie's stocking. He must get presents too! This is just too exciting. 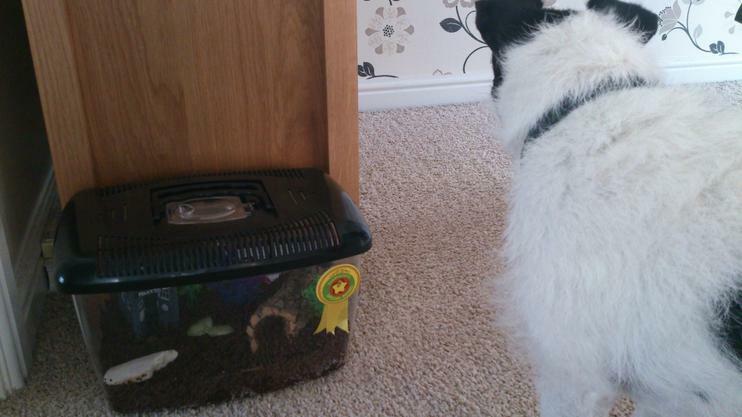 I wonder how Mr.Snail is getting on with Ruby. I hope he isn't causing too many problems! I can't wait to find out where he has been on Monday. I MISS YOU MR. SNAIL! I hope you're having lots of fun. Yippee...Mr. Snail came back to school today to see me. I have missed him. 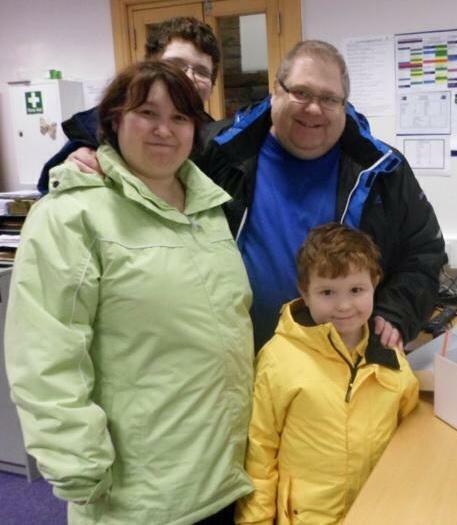 I can't believe how busy he has been with Ruby and her family. 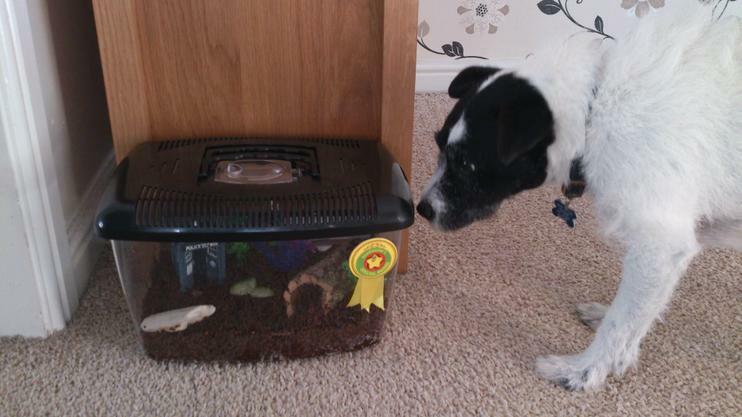 Take a look on Mr Snail's Adventures to see what he has been up to. I'm so jealous of him! I have made a link below. The thing is, I bet Mr. Snail slept all night at Ruby's house where as I'm nocturnal and I like to party all night! I like to sing, dance, set off in my T.A.R.D.I.S., type, read, race around on Turbo snail and basically make a nuisance of myself during the night so I think I'm better off staying where I am and letting Mr. Snail have all the adventures! He has already been booked for various Christmas parties, visits to meet relatives and has even been booked to go to Spain in February! I think I need to send off for his passport very soon or else he might not be allowed out of the country! I wonder how much a snail passport costs? I've had a fantastic day today. After hearing all about Mr. Snail's adventures this weekend I've looked on my emails and I have had lots of requests for Mr. Snail. He is very popular. I've also been sent two fantastic photographs. One is of Thomas and Edward when they went to see Father Christmas...he even arrived on a golf buggy! I think that is like a big TURBO snail. It has 4 wheels and goes fast. They look to have been given fantastic presents from Father Christmas. They also went to Accrington and saw all of Santa's reindeers! I wonder which one is Blitzen? Great photos. They make me feel all Chrismassy! Well, I can't believe how long it has been since I last wrote my diary. I have been so busy getting ready for Christmas. I have been very busy recently making something very special for all my friends in Year 2. The photo below gives a little clue! Can you guess what I have been doing? Can you see how hard I am pushing the roller? You will never guess what else I have been up to! 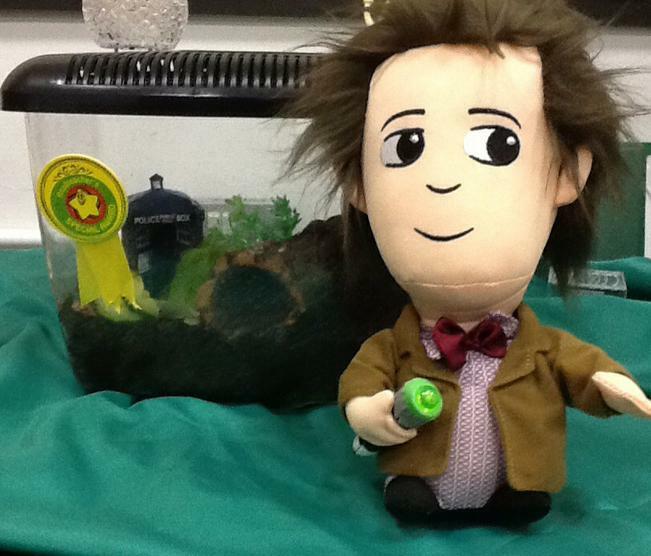 I have been to a party...in school and I played pass the parcel...and guess who came to see me? You will never guess! FATHER CHRISTMAS! He brought me a very special present. He brought all the other boys and girls a selection box but as I can't eat chocolate, he brought me my very own TURBO movie story book. Wow! I was so excited to meet him. He also sent me a video of him and he knew that I had been trying hard all year to eat more vegetables. Wow! How did he know that? Did any of you tell him? Well, for a moment there I thought my messaging service had broken as I haven't had a message from anyone in Year 2 for a long time! Until now...THANK YOU TILLY-MAI. Tilly asked me if I am enjoying reading my TURBO book from Father Christmas. The answer is YES..I am, very much. As you know, I now have two TURBO books. I have asked Mrs Carlile to read the shorter one to you all tomorrow as I think you will all love it. I love that I have a story book about super fast snails! Maybe if I keep practising, I might be in a movie some day...maybe you could be in one with me Tilly as I hear you are also very good at acting and are rehearsing for a concert at the moment! Is there a role for a snail? Anyway, thanks again Tilly. I will see you tomorrow. Santa has found me at Mrs. Carlile's house! I can't believe it! I haven't opened anything yet as I have to wait for Bertie to wake up! He has gone back to sleep after his breakfast as he is too excited! Look at my stocking. Bertie chose it for me. He couldn't find one with a snail on so he found a brown dog with a green hat! I hope Santa brings all my friends what they have wished for. I will write later and tell you all about my presents! MERRY CHRISTMAS. Look what Father Christmas brought me! A big cuddly Turbo snail, a snail memo board, a snail tape measure, 2 more Turbo books, a snail badge and train that spells my name! How lucky am I? Sorry it has taken me so long to put my Christmas presents on here. Mrs Carlile has made me have a few days break from typing as I was quite exhausted at the end of term after jumping around on all the keyboards. However, I thought it was time that I wrote again as I have had a phone call! You will never guess who from! It was from Mrs Carlile's Mother-in-law, who is also called Mrs Carlile...but all the Miss Carlile's and Bertie call her Granny Babs. She always reads my diary and she rang me yesterday wanting to know why I hadn't written anything since Christmas Day! Sorry Granny Babs! I promise I won't have a few days off again! I have had a message from Mrs McKeating...yippee. I hope you have had a lovely Christmas Mrs. McKeating. I have ahead a snailtastic time. Mr. Carlile has been fussing over me and Bertie has made me laugh every day with his jokes and silly games. Here is Mrs. McKeating's message. Hello Stanley and Happy Christmas to you, I have to admit I am missing you. I hope that you are enjoying your holiday and am sure that Mrs Carlile is spoiling you rotten. I bet your friends from school are missing you too. The children in class two certainly love you and on the last day of term they presented me with a book full of stories they had written about you. I have been enjoying myself reading all the stories. I have to admit some of them are quite scary and I don't always survive adventures with you! In the New year I will let you have a read. I look forward to reading The stories that Year 2 have written. I hope I don't attack you too many times in them Mrs McKeating! I'm very sorry if I do! I wouldn't do that in real life...honest! This is me just arriving back from my Intergalactic travels. Can you guess where I have been?